Known as the “Secret Water Island”, Fairmont Maldives, Sirru Fen Fushi is aptly named, with privacy and discretion promised across all of its 120 luxurious villas. Spanning 16 hectares, the island seems to flow around a central 200-metre-long pool, creating an aquatic haven at the heart of the resort, which complements the watery surrounds. 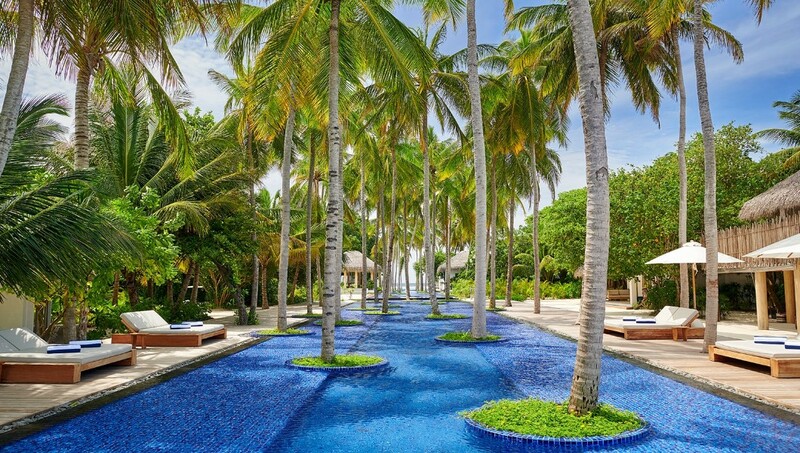 The pool bisects the island, connecting Onu Onu, the beachfront bar, crafted entirely of bamboo by Balinese artisans, on the west coast to the Willow Stream Spa in the east. Whether in the water or on terra firma, guests can discover the sanctuary through a range of inimitable experiences; set sail on a sunset dolphin cruise on a private yacht, or enjoy a private BBQ experience beneath the stars. Truly immerse yourselves in the Maldives and sign up for cultural visits and connect with close-knit communities, or simply get closer to the thriving marine life by diving and snorkelling along the pristine nine-kilometre long house reef that surrounds the resort. What’s more, guests can stay active with Thai boxing classes, yoga, tennis, football and more – working up an appetite for an epicurean adventure at one of the island’s restaurants. From private in-villa barbecues with white-linen service to a world of culinary experiences across four restaurants, the resident chefs have curated diverse and unique local and international flavours for guests to savour. For a true taste of Asia, the signature Japanese restaurant & bar KATA provides a modern menu that offers an array of Japanese-style tapas, Robatayaki grill, and Maldivian-influenced creations. It’s an escape so good you might just want to keep it to yourself.